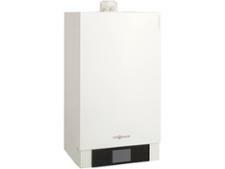 Viessmann Vitodens 200-W System 30kW Weather comp boiler review - Which? The Vitodens 200-W 30kW system boiler from Viessmann is designed for houses that use a separate cylinder to store a ready supply of hot water. The range is compatible with a choice of digital programmers, including a weather detector that adjusts the boiler output automatically as the external temperature changes. Read our full review to find out whether the Vitodens 200-W 30kW is the right boiler for your home, and how satisfied Viessmann owners are with this brand of boiler.